MARIANGELAâs eyes fill with tears as she talks about her parents in Venezuela. A pre-school teacher, she arrived in Chile three months ago with her husband and two children. They live with 48 other immigrants, mainly Venezuelans, in a refuge run by an evangelical church in Puente Alto, a poor district on the outskirts of Santiago. The corrugated-iron rooms are stuffed with bunk beds and mattresses. There is just one bathroom. Children play on a dusty patio among discarded bits of wood and metal and an abandoned sofa. Despite the discomfo rt she has to endure, Mariangela feels lucky. She has found work in a shop and her children are going to a municipal school and to a nursery that has waived its fees. âI heard that Chileans were snobs but I have been treated only with kindness,â she says, pointing at her olive-toned skin. Chile has recently become a magnet for migrants. From 2007 to 2015 the number of immigrants living in Chile increased by 143% to 465,000 peo ple, about 2.7% of the population. That is the third-highest rate of increase among members of the OECD, a rich-country club. Peruvians, Colombians, Argentines and Bolivians made up about two-thirds of migrants in that period. Since then, immigration has shot up at an even faster rate. Last year, Venezuelans were the largest group of new arrivals, followed closely by Haitians. Now 1m foreigners are thought to live in Chile. A third of them are undocumented. Chileans should welcome immigration. Birth rates are falling, the population is ageing and unemployment is low. Chile has a shortage of workers in health care, technology and agriculture. It needs âboth manual and skilled labourâ says Rodrigo Ubilla, the under-secretary of the interior. In 2015 immigrants had more years of education, higher salaries and higher rates of employment than Chileans, according to the countryâs survey of poverty. But the abrupt rise in immigration has come as a shock to a country that had no empire and is a long way from the worldâs main trouble spots. Most Chileans are descendants of Spanish colonisers and indigenous people. Later immigrants from Spain, Germany, Croatia and other places added to the mix. Chileans tend to think of themselves as transplanted Europeans (and largely ignore the countryâs indigenous heritage). The new diversity has brought two problems. It has overwhelmed an immigration system designed for smaller numbers. And it has provoked a backlash against newcomers. SebastiÃ¡n PiÃ±era, who became Chileâs president last month, proposes to deal with both by making immigration more orderly but also harder. Chile has less immigration than many other countries, but 68% of Chileans want to restrict it, according to a survey by the National Institute of Human Rights. Nearly half think immigrants take jobs from locals. Haitians provoke most hostility. 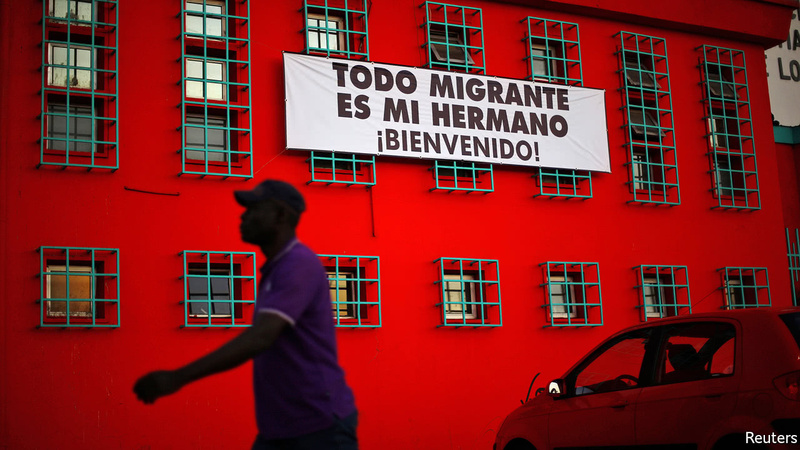 Last year the number of Haitians in Chile grew by 100,000, in part because Brazil mad e it harder for them to come. Most do not speak Spanish and tend to be black as well as poorer and less educated than other Latin American immigrants. They are subject to more assaults and insults and often work in terrible conditions. Earlier this year, labour inspectors found five Haitian forestry workers living in a stable in southern Chile without electricity or sanitation. Haitians with higher education often do the same manual labour as their compatriots (other immigrants also have that problem, because Chileans are slow to recognise foreign degrees in some professions). âHaitians are not welcome in Chile,â says Edward SultÃ¡n, who works for An Nou Pale (âLetâs Talkâ) Foundation, a charity that helps black people integrate into Chilean society. âIf youâre black, youâre considered inferior.â A video posted recently on social media showing Haitians arriving at Santiago airport spoke of an âinvasionâ. Checho Hirane, a radio presenter, worried aloud tha t uncontrolled immigration would âchange our raceâ, though he later backtracked. Colombians are next to Haitians at the bottom of an informal pecking order, says JosÃ© Leonardo JimÃ©nez, a communications graduate from Venezuela. That may be because some Chileans stereotype Colombians as drug-dealers. Venezuelans, he says, are higher up, in part because they tend to have more education. While proclaiming that Chile âis open to and welcomes immigrationâ, Mr PiÃ±era is trying to limit and control it. On April 9th he announced that foreigners who come as tourists will no longer be able to ask for temporary work visas once they are in the country. Instead, they will have to apply for a new âopportunitiesâ visa outside Chile. Decisions will be made based on a points system, which favours those with sought-after skills and education. Successful applicants will be treated well. They will get an identity number which will let them open ba nk accounts, sign housing contracts and so on. Immigrants will have the same access to public health care and education as Chileans. To attract the most highly skilled, Mr PiÃ±era announced a new visa for postgraduates from the worldâs top 200 universities. Haitians will face much more restrictive treatment than others. Tourists will have to apply for 30-day visas outside Chile (compared with the 90-day visas issued at the border for citizens of most Latin American countries). To soften this blow, the government will issue up to 10,000 âhumanitarianâ visas a year to Haitians who already have relatives in Chile. Venezuelans will be treated more indulgently. Unlimited numbers will be able to apply for a âdemocratic responsibilityâ visa, an acknowledgment of the countryâs âgrave democratic crisisâ and the refuge it provided when Chile was a dictatorship in the 1970s and 1980s. Unlawful immigrants from all countries who arrived in Chile by April 8th will be a llowed to stay. However, Mr PiÃ±era said the government would get tough with people-smugglers and make it easier to expel anyone who violates immigration laws. A new âmigration-policy councilâ will keep updating the countryâs strategy. The visa regime will take effect under a presidential decree while the new law is debated in the congress. The governmentâs new policy is likely to get a mixed reception in Quilicura, a district in the north of Santiago where most immigrants are Haitians. Even before Mr PiÃ±eraâs amnesty, the local authorities had made public services available to all, regardless of their legal status. They provide Spanish lessons and help in finding work. Creole-speakers work in schools and health centres. This reduces the risk that immigrants will cluster in ghettos, sell drugs and trade illegally, says Juan Carrasco, the mayor. Mr PiÃ±eraâs new policy will help them, by enshrining their right to stay and to use public services. But it may make some Haitians feel more than ever like second-class non-citizens.